This is an excellent high level traverse along the Ingleborough to Park Fell ridge which you can see from the front door. 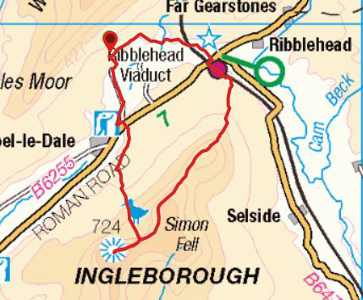 It starts by climbing Ingleborough then follows the ridge to Park Fell and back via Ribblehead. From Broadrake follow the access track and lane back through Philpin Farm to the B6255 and turn left along the road for a short distance. Just past the Hill Inn a gated stile in the wall leads onto the fellside. Go up here a hundred yards or so and turn right through a gate and across the field to reach Southerscales Nature Reserve. Continue along the obvious track through the reserve as it climbs gradually then winds up through the limestone outcrops and past the enormous depression of Braithwaite Wife Hole to go through a gate to the moor beyond. Climb the stone flagged and duckboarded path in front of you to reach Humphrey Bottom. From here there is a very steep section climbing up to gain the ridge. Cross a stream and go through the kissing gate before a final pull up to reach the summit plateau. The summit itself is at the far side of this plateau, with a stone shelter, cairns and trig point. 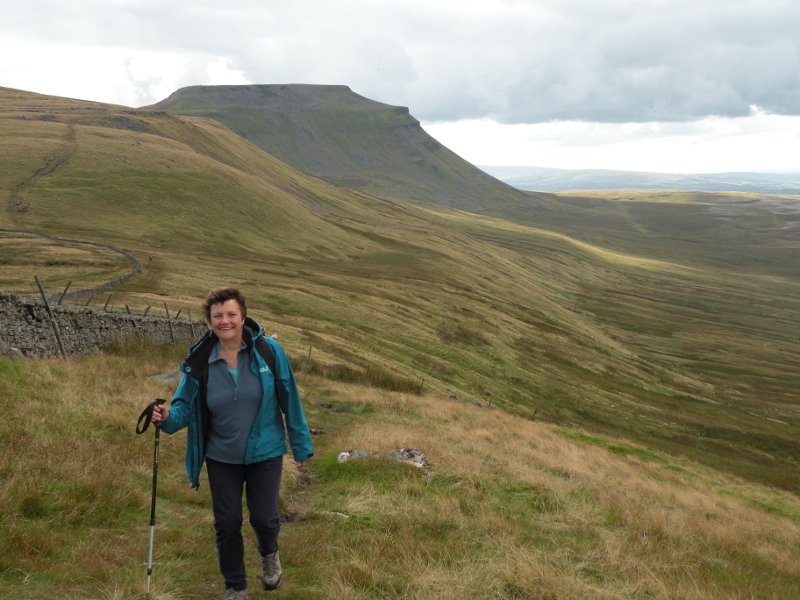 Go just beyond the shelter for views down to Ingleton and across to Morecambe Bay. From the summit retrace your steps to the top of the very steep section then take the superb high level track which curves round the head of the cirque. The path continues skirting the summit of Simon Fell and along to Park Fell with great views down towards the viaduct. Drop steeply off the end of Park Fell and after passing through a gate towards the bottom take a fork left and follow the wall down to a stile on the left. Cross the stile and straight away turn left, heading north, along a quad bike track. When the quad track swings right keep straight on and pick your way carefully on rough ground between grass covered limestone pavement to reach a wall and gate into Ribblehead Quarry. The quarry is disused and is now part of the Ingleborough Nationsl Nature Reserve, managed by English Nature. Follow green waymarks through the quarry to exit on a track which leads down to the B6255 at the southeastern end of the viaduct. Turn right under the railway and past the Station Inn, then left onto the track leading towards the viaduct. Continue under the viaduct and on to Gunnerfleet Farm. After crossing Winterscales Beck turn left along the farm road for about 100m until a fingerpost points right towards Ivescar. Follow the footpath across fields and over stiles to reach the farm. Enter the farmyard and turn left in front of the farmhouse, taking the lower track across the field. After crossing a sleeper bridge over a usually dry watercourse fork right to a small gate in the wall. It's just a short distance now across fields with a couple more gates to get back to Broadrake.